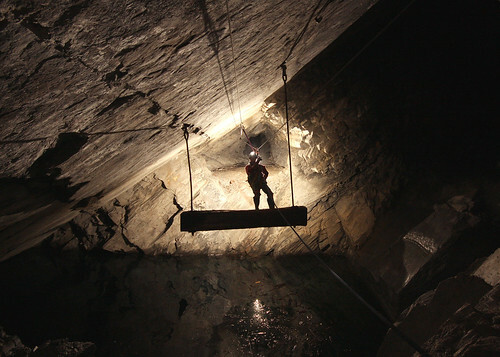 An invitation came from Evan of North Wales Caving Club to join them on the classic Croesor to Rhosydd through trip. 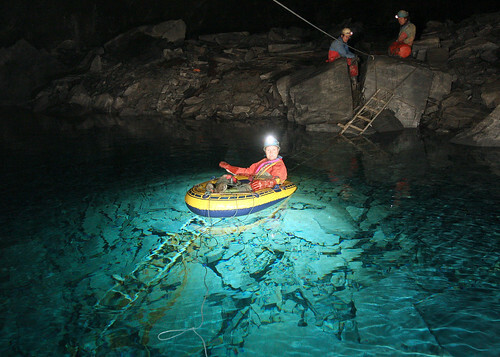 As it was still early in the year, and not having completed our annual mine trip Keith and myself decided to take up the offer. We set off from Keith's at 6.30 in the morning and proceeded to drive for the next three hours in search of an open cafe where we could consume breakfast. Alas there are no cafes open in North Wales on a Sunday morning, so we had to make do with a coffee, cake and sausage bap from a store in Ffestiniog. We headed up through Tanygrisiau to a car park where we waited to the alloted time. At 10am no one was there so a phone call was made to find that everyone else was in a second car park 200m away at the other side of a spoil pile. We faffed and changed in the rain and wind before setting off on the two hour slog up the mountain to the entrance to Croesor mine. 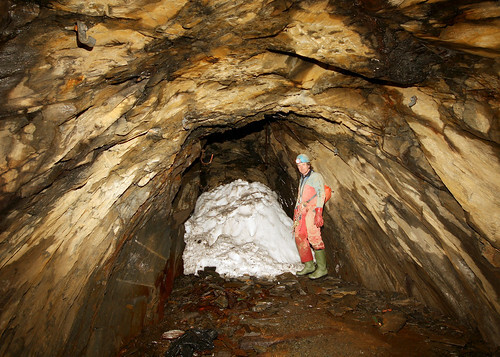 We kitted up and headed off into the mine, only to find a couple of minute in a large mound of snow that looked to fill the passage. A gap over the top allowed us to continue on our trip after taking a photo or two. 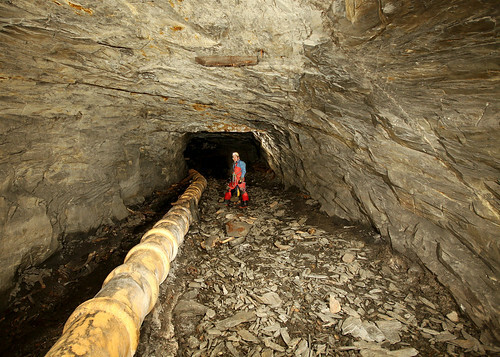 We moved quickly through the mine until we came to the top of the first pitch down, where some care was needed with the rope protection and loose rock on the way down. 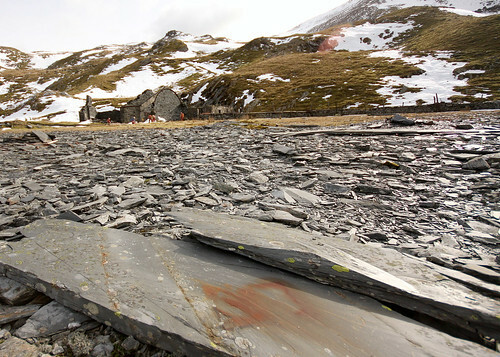 We were now travelling though a very unstable area where numerous roof falls were in evidence. At the top of the second pitch we were greeted with some interesting rigging around numerous boulders, as the walls were too loose to rig from. 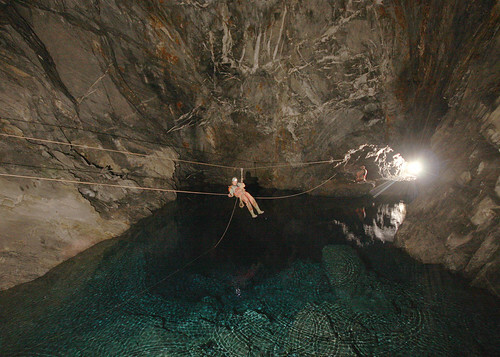 Heading down this giant gallery a lake is encountered where a steel zip wire provided entertainment in the crossing. A short passage at the other side took us to a second lake which we crossed by inflatable dingy. We paused for a drink and lunch at the other side of the lake, before heading off down some straight forward passages to the first of the renowned bridges. 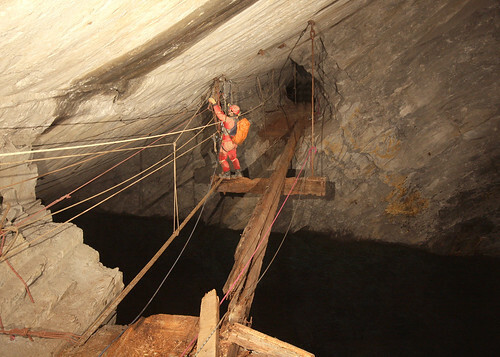 This was the best preserved of the bridges and gave is a gentle introduction into the art of balancing on a rotten wooden beam above a massive drop over deep water. Plenty of photos and video were taken as we enjoyed the challenge of the crossing. We soon found ourselves at the second bridge, or what's left of it! Travelling down a zip wire with an acrobatic move half way across to negotiate the only remaining support of the bridge proved fun for everyone. We then reached the third and most dangerous of the bridges, the fun now stopped as this was a challenge to pass. The first half was a tiptoe along a single rusty rail to the centre support. From the centre a climb up was needed to clip into a zip wire to take you across to the other side. Soon we found ourselves at the final lake with a 6 metre abseil down into a rubber dingy, followed by a paddle across to the far side. 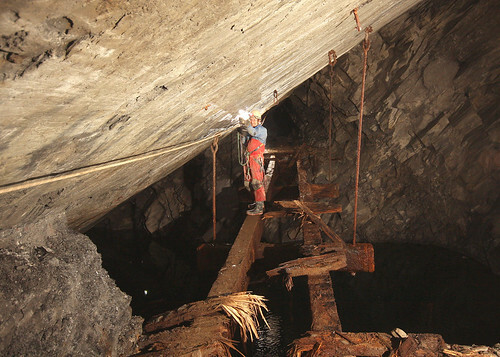 A short pitch up took us to the passage that links with Rhosydd mine. A detour was made up one of the inclines, to look at some of the artifacts at the top before we made our exit out of Rhosydd, into the dwindling daylight. We walked down the mountain in the cold fresh air as dusk settled. The walk up the mountain had nearly killed me, but this was one of the classic trips, and I am very glad that I did it. 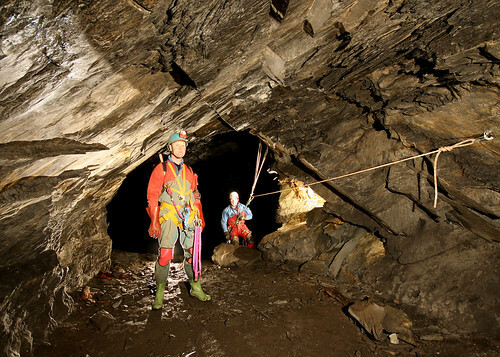 The company of the NWCC crew was very much appreciated and look forward to getting them into Dan Yr Ogof, if the weather will ever let us. I've checked through the back issues of the Club newsletter and the only other time the Club has done this trip was in 1997. If my memory serves me well the team was: Me, John, Graham, Rob, Jane and Emma. At that time there were no zip wires, we had to rig the pitches and we had to swim access the big lake. 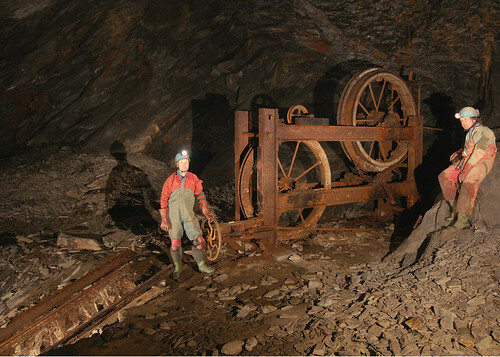 It's a much easier trip now, but still a classic - for a mine that is.